This is the season of the new iPad the iPad 2 which is just around the corner and there is so much hype about the new device. There are a million apps out there in the App store ready to be used but how do you decide what are the best for your new iPad2. So here i have a list some Must have Apps for the iPad2 which mainly come under the entertainment and games category to keep you entertained and keep Boredom away from you. iMovie the official App from Apple iTunes helps you turn the HD video you shoot on your iPad, iPhone, or iPod touch into a masterpiece. This fun, fast, feature-rich app is designed especially for Multi-Touch interface mainly of your iPhone, iPad and iTouch. This Applications allows you to directly publish your masterpiece onto Youtube or Send via MMS and e-mail. There are three resolution choices: Medium (360p), Large (540p), and HD (720p) which can be pretty useful in deciding the size of the Video needed. 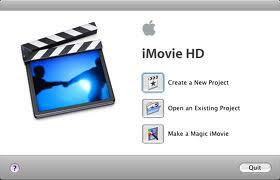 The iMovie App is a Must have for all theiPAd 2 and iPhone 4 users and make sure you download and install this $4.99 App only in your iPad2 and iPhone 4 devices. Not the most intuitive app. Can’t customize title fonts or size. GarageBand turns your iPad into a collection of Touch Instruments with a full-featured recording studio — so you can make music anywhere you go. 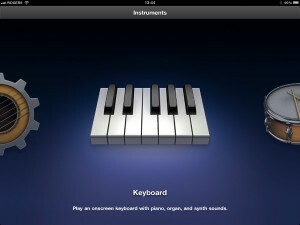 Use Multi-Touch gestures to play pianos, organs, guitars, drums, and basses on your iPad2. This is a feature Rich app and is very competitively priced at $4.99 in which you will be getting an array of music features which at one place can be a dream come true for music lovers and you can do things by mixing many instruments at a time which cannot be done virtually by one person at a time. Play your iPad like a musical instrument – Strings, keyboards, and percussion from classic to electric instruments are available. Sound like a virtuoso with Smart Instruments– Strum chords on acoustic and electric Smart Guitars, or trigger finger picking patterns for popular chords are all available in this App. Create a song anywhere you go – Arrange and mix your song with up to eight tracks using Touch Instruments, audio recordings, and loops. Share your songs– You can E-mail your songs directly fron your iPad or even Export your edited song into iTunes Library of your Mac or PC. With such a feature rich App available at such an affordable price it has to be the best deal for music lovers, with the iPad2 interface making it a heavenly experience. This clearly proves why Steve Jobs called the iPhone and iPad gaming devices it has a heart-pounding and visually astounding 3D effect that puts the steering wheel directly in your hands. We can say that it is the most visually stunning, feature-complete game for iOS till date. With the help of the Gyroscope which makes it steer better and the new PowerVR SGX 543 graphics chip in iPad 2 lets them turn the textures to overdrive and make the user experience a pleasure to play and watch. Infinity Blade is the all-new action RPG sword-fighting game for the iPod Touch, iPhone, iPad and iPad2 . Infinity Blade takes handheld gaming to new heights with gorgeous visuals, adrenaline-fueled battles with characters which are perfectly made in full detail. There are no virtual joysticks or buttons to press. You don’t have to walk through the castle doors either. Instead, there are touch points for entrances to different rooms. You choose where to go, but the movements are scripted. Once in a room, you can manoeuvre the camera with your finger, searching for hidden loot and potions. There’s always at least one enemy in a room waiting to test your mettle. This is where the fun part kicks in the Combat part is the most appealing part of the whole Game. With the better quality of the iPad screen you can surely get a great game for $5.99. For Action lovers this game is a must buy with all the fights. Dead Space is an intense action shooter dynamic game where players have to keep themselves alive in an abandoned space cruiser while battling twisted mutated humans known as Necromorphs. It works very well for iPad2 with its super cool display and the Suspense filled action in this game with all the Shocking moments this is an amazing game for the Adults because of all the blood shud. This is one of the iPad’s best games, between the gorgeous visuals, smooth gameplay and continuous challenge. So if your buying a new iPad2 then you surely cant miss out on this Game.